Lies, distortions and self-serving obfuscations are to be expected when political and business leaders discuss far away places. Salutin vividly captures an important dynamic of political life. What do most Canadians know about our government’s actions in Afghanistan or Haiti? Most of us have never been to those countries and don’t know anyone living there, from there or even who’ve been there. We are heavily dependent on media and politicians’ portrayals. But, as I detail in A Propaganda System: How Canada’s Government, Corporations, Media and Academia Sell War and Exploitation, international correspondents generally take their cue from the foreign policy establishment or diplomats in the field. Journalists are prepared to criticize governments and corporations to a certain extent on “domestic” issues, but the spirit of “challenging power” largely disappears regarding foreign policy. One reason is that nationalism remains an important media frame and the dominant media often promotes an “our team” worldview. Another explanation is the web of state and corporate generated ideas institutes, which I review in A Propaganda System, that shape the international discussion. 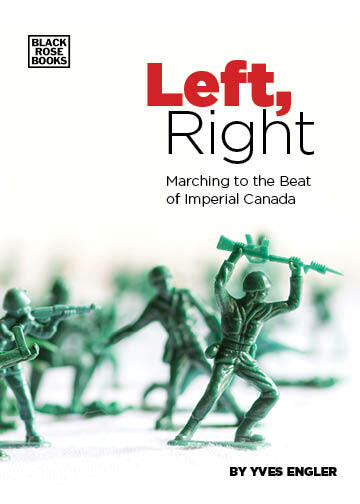 In a forthcoming second volume I look at the Canadian Left’s contribution to confusing the public about international policies. The state/corporate nexus operates largely unchallenged in the Global South because there is little in terms of a countervailing force. Instead of criticizing the geo-strategic and corporate interests overwhelmingly driving foreign policy decisions, the social democratic NDP has often supported them and contributed to Canadians’ confusion about this country’s international affairs. The NDP endorsed bombing Serbia and Libya and in recent years they’ve supported military spending, Western policy in the Ukraine and the dispossession of Palestinians. The NDP has largely aligned with the foreign policy establishment or those, as long time NDP MP Libby Davies put it, who believe a “Time Magazine version” of international affairs. Closely tied to the NDP, labour unions’ relative indifference to challenging foreign policy is another reason why politicians can “blather freely” on international affairs. On many domestic issues organized labour represents a countervailing force to the corporate agenda or state policies. While dwarfed by corporate Canada, unions have significant capacities. They generate hundreds of millions of dollars in annual dues and fund or participate in a wide range of socially progressive initiatives such as the Canadian Health Coalition, Canadian Council for Refugees and Canadian Centre for Policy Alternatives. But, unions rarely extend their broader (class) vision of society to international affairs. In fact, sometimes they endorse unjust international policies. To the extent that politicians’ “blathering” is restrained it is largely by other countries. The recent political conflict in the Ukraine provides an example. Canadian politicians have aggressively promoted a simplistic, self-serving, narrative that has dominated the media-sphere. But, there is a source of power countering this perspective. Moscow financed/controlled media such as RT, Sputnik and others have offered a corrective to the Western line. A comparatively wealthy and powerful state, Russia’s diplomats have also publicly challenged the Canadian media’s one-sided portrayal. An important, if rarely mentioned, rule of foreign policy is the more impoverished a nation, the greater the gap is likely to be between what Canadian officials say and do. The primary explanation for the gap between what’s said and done is that power generally defines what is considered reality. So, the bigger the power imbalance between Canada and another country the greater Ottawa’s ability to distort their activities. Haiti provides a stark example. In 2004 Ottawa helped overthrow Haiti’s elected government and then supported an installed regime that killed thousands. Officially, however, Ottawa was “helping” the beleaguered country as part of the “Friends of Haiti” group. And the bill for undermining Haitian democracy, including the salaries of top coup government officials and the training of repressive cops, was largely paid out of Canada’s “aid” to the country. With a $300 US million total budget for a country of eight million, the Haitian government had limited means to explain their perspective to the world either directly or through international journalists. On the other hand, the Washington-Paris-Ottawa coup triumvirate had great capacity to propagate their perspective (at the time the Canadian International Development Agency and Foreign Affairs each spent 10 times the entire Haitian budget and the Department of National Defence 60 times). The large Canadian embassy in Port-au-Prince worked to influence Canadian reporters in the country and their efforts were supplanted by the Haiti desks at CIDA and Foreign Affairs as well as the two ministries’ communications departments and Canadian military officials. To counter the “fact free zone” individuals need to educate themselves on international issues, by seeking alternative sources of information. More important, we should strengthen internationalist social movements and left media consciously seeking to restrict politicians’ ability to “blather freely”.